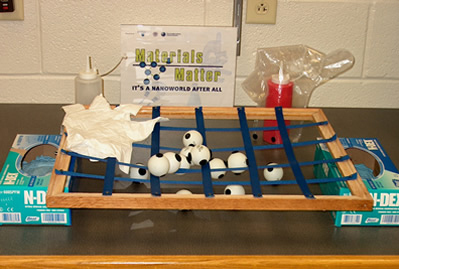 Handmade activities: "Materials Matter - It's a Nanoworld After All"
Science learning doesn't only happen in a lab or classroom. Science is an ongoing process of observing and questioning these observations. The topics of the activities found here are designed to help you find science in the world around you! This website is home to our complete set of family oriented K-12 activities that correlate with the museum shows designed jointly by the Penn State MRSEC program and the Franklin Institute Science Museum. The activities are posted as a reference for museum visitors, K-12 students, families and teachers who are interested in learning about topics in materials and nano-scale science. IPSE has designed activities that lead you through the process of science learning in the comfort of your own home using easily accessible and common materials. There is also no need to have prior knowledge of the science topic in order to enjoy the experiments. These activities can also be used for fun on a rainy day or can be used to design science projects for a science fair. Please take the time to explore and try out as many of the activities as you can! The topics for the activities were designed to complement demonstrations from the museum shows designed jointly by the Penn State MRSEC program and The Franklin Institute Science Museum. You can learn more about the museum shows here. If you visited a museum show, you should definitely take the time to explore the topic that you saw there. However, you do not need to be familiar with the museum show to enjoy and learn from these activities.